Epic360 offer digger hire in Auckland and the North Shore areas complete with a skilled operator! 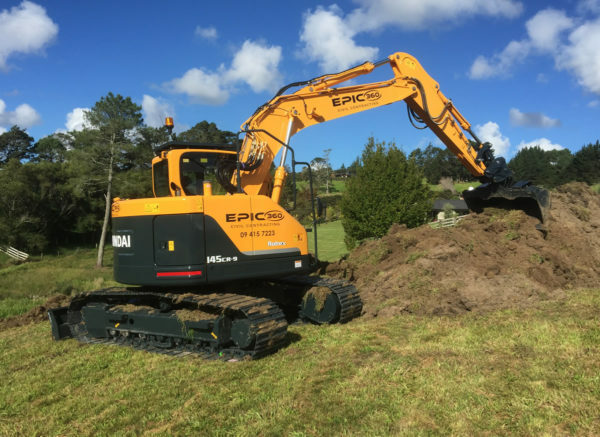 Epic360 provides a full digger hire service in Auckland and the North Shore. Providing digger hire for all scales of project, we can choose from a wide hire fleet encompassing diggers from versatile 1.5T to large 10T diggers. All come equipped with a fully qualified, experienced driver to ensure that your digger hire is used to its maximum potential. In providing a complete service, Epic360 ensure that the right tool, in the hands of the right operator, is used to its maximum potential at its maximum efficiency to the minimum of cost. Available for residential and commercial projects, Epic360 will provide support throughout the build from consultation to completion; we provide both the experience and the expertise to ensure that the project exceeds expectations in usability and aesthetics. This includes site clearance and spoil removal from even the most difficult to access sites. The diverse range of diggers for hire means that the tightest residential builds in Auckland are can be completed without delay. Epic360 are Auckland’s groundwork experts, with an extensive fleet of vehicles to ensure that no aspect of the project is left to chance. Hugely popular for residential improvement projects in Auckland or for access to the more complicated of building sites are the bobcat fleet. Small, fast and agile, bobcats are fantastically versatile. At the other end of the range are the 10 Tonne diggers, capable of fast removal of great quantities of earth in a very short time. Of course, at this end of the digger hire scale, the value of the experience of having a team to coordinate the ancillary operations, especially spoil removal is priceless. Epic360 can provide the full service for both excavator and digger hire, alongside truck rental and spoil cartage, but have also built up lasting working relationships with many contractors in Auckland and the North Shore, a testament to our professionalism and care. © 2018 Epic360. All rights reserved.